I’ve been thinking a lot about the brain for the past five years or so. Something lucky, before I begin: My brain still works pretty well. I do crossword puzzles, I am physically active, and I read and write all the time. Even so, there are no guarantees. Dementia and Alzheimer’s don’t care all that much about what you’ve done to stave them off. To say nothing of brain injuries. Here are some of the reasons I think about the brain – maybe more than the average person. First – one of my sisters suffered a traumatic brain injury four years ago, and I have been very involved in her rehabilitation, and in her life since her accident. This is a sister I never had a close relationship with, but who I would now kill for. This is basically the premise of a memoir I just completed about being a sister. Second, my father died of complications from dementia, a harrowing experience I wouldn’t wish on any family. Third, I started writing a novel that was based on the premise that you could “freeze” your brain (or something like that), and “live” forever. Or, at least your brain could. I got well into this novel until I hit a wall and set the book aside for a while. But in the meantime, I did a ton of research into the brain. So, this is a subject I obviously find fascinating. 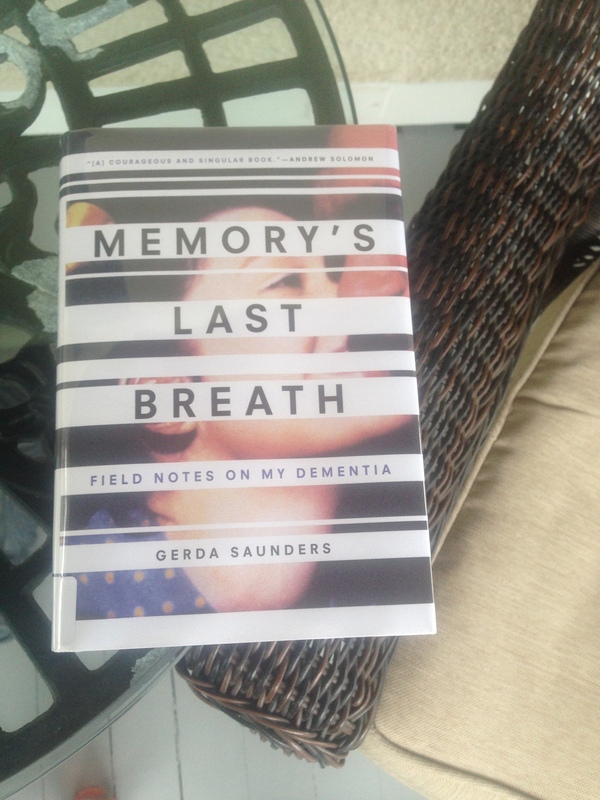 Just recently I read a brand new memoir called Memory’s Last Breath: Field Notes On My Dementia by Gerda Saunders. It is an amazingly raw and tender and sad and joyous story. I had originally heard the author a few weeks ago being interviewed on NPR, and immediately went to the library to get the book. I highly recommend finding the interview on NPR, and also reading the book. And if you can bear it, and haven’t done so yet, read Still Alice by Lisa Genova, and see the movie by the same name (with Julianne Moore). I know it’s hard to talk about this, and read about it, but the more we face these issues with some type of understanding (and even humor and grace) the better equipped we might be to survive with our humanity intact, and maybe even enhanced. Previous Article Is It All In A Name?